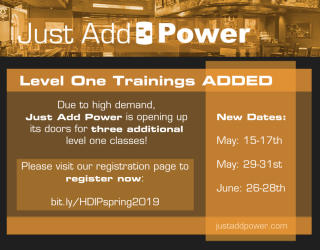 Just Add Power has added three new Level 1 System Design & Configuration training sessions to its spring 2019 schedule. Taking place May 15-17, May 29-31, and June 26-28 at the company's Largo, FL headquarters, the course is designed to provide attendees with an introduction to J+P, HDMI over IP, and basic networking, while offering a hands-on experience setting up a system from beginning to end. "To provide attendees with the best training experience possible, we have always kept our class sizes small—an approach that has earned us a lot of positive feedback," said Eric Martin, education director at Just Add Power. "However, at the rate that residential and commercial installers are switching to Just Add Power from legacy HDMI matrix solutions, it has also meant a pronounced shortage of spaces in our spring schedule. We are thrilled to have this problem. And since we won't compromise on the quality of our training, the only solution is to open our doors for more classes." To register for one of the newly added Level 1 System Design & Configuration training sessions, visit http://www.bit.ly/HDIPspring2019.